The West Linn baseball team has accomplished a great many things in 2017. A Three Rivers League championship. The top ranking in the state. And the West Linn Tidings was there to cover it like no one else, piling up stories, photos and interviews like the Lions piled up wins. Next up, the Lions will face No. 2 Clackamas in Saturday's 2017 Class 6A state championship game. That game is set for 5 p.m. Saturday at Volcanoes Stadium in Keizer. To see even more West Linn baseball photos from this year, click here and then pick the game of your choice to see additional images. To see all our coverage of the Lions from 2017, see below. A year ago, the West Linn baseball team battled to second place in the Three Rivers League and then advanced all the way to the Class 6A state quarterfinals. But as great as all that was, it won't be nearly good enough for the Lions in 2017. West Linn comes back strong with four all-leaguers this year, and while the Lions must replace two second-team all-Three Rivers League pitchers — including 2016 TRL Utility Player of the Year Will Matthiessen — they believe they have enough talent to win their league and make a deep run in the playoffs. The West Linn baseball team entered the 2017 season with its goals sky-high. And so far, the Lions have not disappointed. West Linn kicked off its 2017 campaign with a 15-1 rout of defending Class 6A state champion Jesuit on March 14, then made it two in a row by edging Lincoln 3-2 on March 15 at West Linn High School. There's no doubt about it — there's a rivalry between West Linn and Clackamas. The Lions held the upper hand in football, beating the Cavaliers 41-20 in the Class 6A state semifinals. After splitting two non-league contests, the Clackamas boys basketball team knocked off West Linn 78-71 in the semifinals of this year's state tournament. 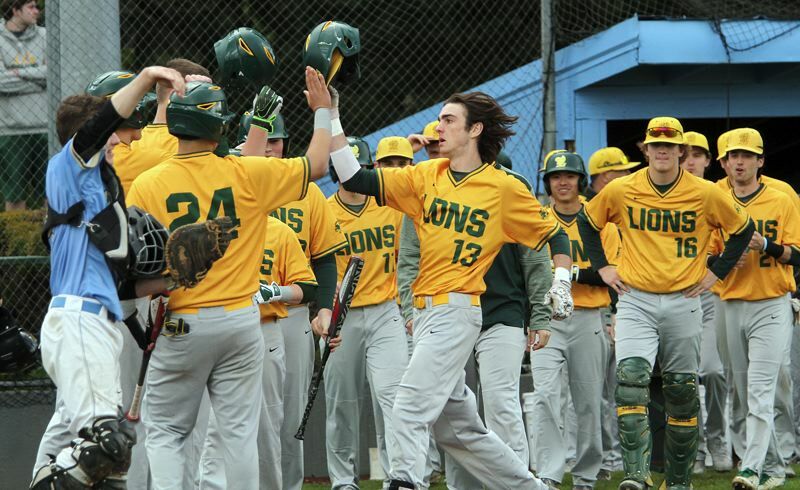 The two schools faced off again on Thursday — albeit in a somewhat more modest setting — when the Lions hosted the Cavaliers in a non-league baseball game at West Linn High School. In the end, the Cavaliers broke open a scoreless tie with four runs in their final three at-bats to win 4-0. Thursday's Clackamas at West Linn baseball game had all that and more, the Cavaliers pulling away to post a 4-0 victory. You've heard the saying "You only get one chance to make a first impression," right? The West Linn baseball team made sure not to waste that chance on Friday. The Lions, playing at Lakeridge High School in Three Rivers League action, dropped six runs on the Pacers in the top of the first inning, added two more in the top of the second and used that early deluge to run away from Lakeridge 11-1. It took two days, some late-inning drama and definitely, some anxious moments. But when it finally all ended, it was the West Linn baseball team that emerged victorious. The Lions, in a game that started April 19, was suspended due to rain and then finished on April 20, broke a long-standing 1-1 tie with three runs in the top of the seventh inning, and then held off a Tigard rally in the bottom of the frame to win 4-2 in a Three Rivers League contest played at Tigard High School. And, for the West Linn High School baseball team, it was a big win. The Lions completed a showdown series sweep and strengthened their grip on first place in the Three Rivers League standings by rallying for a 3-2 win over Tualatin in a back-and-forth battle played Friday at Tualatin High School. The calendar tells us that the first round of the state baseball playoffs don't arrive for almost two weeks. The West Linn and Lake Oswego baseball teams hooked up in a Three Rivers League classic on Tuesday afternoon that had "playoff" written all over it. The day's two starting pitchers combined for almost 16 scoreless innings, saw their defenses make play after play to keep the game deadlocked at 0-0 and didn't relent until West Linn senior first baseman Jake Porter smashed a two-out solo home run over the left field fence in the bottom of the eighth inning to beat the Lakers 1-0 at West Linn High School. For the second time in three games, a West Linn baseball player walked to the plate with a chance to beat Lake Oswego in extra innings. And for the second time in as many tries, the Lions delivered. Knotted 2-2 with No. 28 Lake Oswego in the bottom of the 10th inning on Friday night, top-ranked West Linn sent Jonathon Kelly to the plate. With the bases loaded and two outs, the sophomore lined a single to right field that plated Tim Tawa, won the game 3-2 and caused the West Linn dugout to stampede the field at West Linn High School once again. The West Linn baseball team put that adage into play in its Class 6A state playoff opener, beating Central Catholic 5-3 at West Linn High School on Monday. 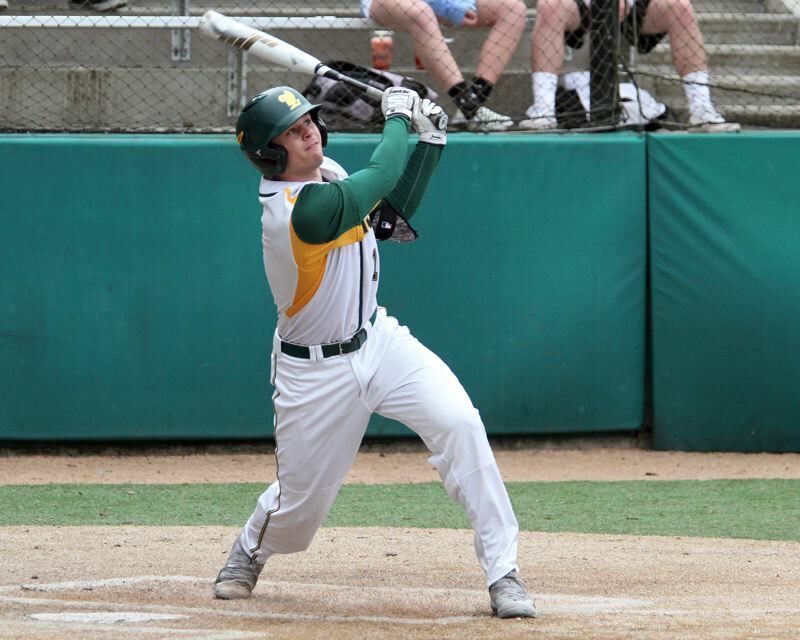 The West Linn baseball team got a minor scare in its Monday playoff opener. On Wednesday, the Lions played well enough to score the rest of the state. Hosting No. 16 McNary in the second round of the Class 6A state playoffs, top-ranked West Linn got a shutdown pitching performance from starter Tim Tawa, banged out 12 hits (seven for extra bases) and dusted the Celtics 10-1 at West Linn High School. The top-ranked West Linn baseball team looked like it on Wednesday. The Lions, hosting McNary in the second round of the Class 6A state playoffs, got a three-hit pitching performance over six innings from Tim Tawa, banged out seven extra-base hits and rolled to a 10-1 victory over the Celtics at West Linn High School. The heart of the West Linn batting rotation is arguably the best in the state, but it was the Lions' nine-hitter that played a huge role for them in the quarterfinals. West Linn third baseman Evan King got on base in all three plate appearances and scored two runs in West Linn's 8-1 victory over Gresham on Friday afternoon. The Beaverton baseball team had West Linn right where it wanted it. The fourth-ranked Beavers, playing at top-seeded West Linn in Tuesday's Class 6A state semifinals, pushed across one run in the top of the third inning while pitcher Trace Hokkanen kept throwing zeroes at the Lions. But West Linn turned the tide in the bottom of the fifth inning, putting together three hits and one error to score three runs and beat Beaverton 3-1 at West Linn High School. The West Linn baseball team had to earn this one. The top-ranked Lions, hosting No. 4 Beaverton in the Class 6A state semifinals, trailed 1-0 entering the bottom of the fifth inning, but broke through for three runs there and used that outburst to beat the Beavers 3-1 and secure a berth in Saturday's state championship. It almost figures that West Linn and Clackamas would battle one more time in the 2016-17 school year, this time with the two schools' baseball teams due to meet up in the Class 6A state championship game. That matchup is set for 5 p.m. Saturday at Volcanoes Stadium in Keizer. To say that the West Linn baseball team has had a great season would be a massive understatement. The Lions are the top-ranked team in the state, won the Three Rivers League championship handily and carry a 21-game winning streak. A big season like that deserves great photos, so here's a slideshow of all the best images from West Linn's 2017 campaign to date. Click through, then click through again to pick out your favorites.